A sparkling wine made in Cornwall has won Britain's only gold medal in this year's International Wine Challenge. 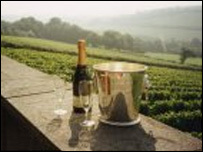 It is the second honour in two years for Sparkling Brut 2001 made by the Camel Valley Vineyard. Winemaker Bob Lindo said the Cornwall wine was the only one in the world outside Champagne in France to win a gold award. Camel Valley wines are now being stocked by wine merchants, national supermarkets and top UK restaurants. Mr Lindo said: "It's quite overwhelming. We know we're up there near the top, but to get the only gold anywhere in the whole world outside Champagne is just absolutely amazing." Mr Lindo, whose son Sam is also a winemaker at Camel Valley, believes Cornwall's mild climate helps give the wines their distinctive style. "We have a maritime climate which is good because it means a slow ripening process and we don't get sudden winters. "The whole point of our business is to concentrate on making the very best wine we can. We haven't diversified into restaurants and the like. We also have the very latest quality equipment for making sparking wine." The 10-acre vineyard was planted in 1989 and produces about 35,000 bottles of red, white, rose and sparkling wine each year. Celebrity chef Rick Stein serves the Cornwall Sparkling Brut at his famous fish restaurant in Padstow.